The sun was shining, the skies were blue, and the temps mild. David and I loaded up the car with fishing gear, food, and the dogs. We headed out to our favorite fishing spot at Lost Creek for a day of fishing and relaxation. I have been frustrated with a bad case of writers block and hoped a change of scenery would help. 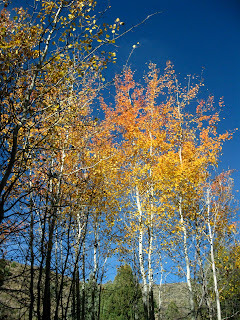 While David set up his fishing gear, the dogs and I took a long walk in the surrounding foothills. The weather and lighting was just right to play around with photography. I feel my muse returning. The fishing has been really slow all summer and fall. We think it's because the spring and summer were so wet that there was an abundance of feed, and the fish were interested in bait and worms. Whatever the reason, David was a bit frustrated because he only had a few nibbles and one catch. I took a sip of juice and met up with a bee who had the same idea. OWWW! David is still working through some depression, but he's taking the right dosage of medicine, avoiding triggers as much as possible, and working hard to keep it from overrunning his life. He recently started working at a condominium where he does light maintenance work and can set his own time and pace. We're grateful for it. We visited our son Ben and his family for my birthday in September. David had a bad case of travel anxiety before we left, to the point where I seriously considered leaving him home. Fortunately, once we were on our way he calmed down, and we had a nice three hour drive north. I forgot my camera in my haste to get going! We enjoyed a relaxing visit, were excited to see their new home, and had fun playing with the grandchildren (ages 5, 4, 2, and 6 months). When four-year-old Hailee found out it was my birthday, she said, "Where are your presents? She giggled when I said, "You're my present!" I don't think she believed me, but seeing them settled and happy was the best present I could ask for. I had a nice chat with Soldier Brian recently when he was home on mid-tour leave. He had a great time relaxing and being with his wife and three young children (3, 18 months, 7 months). "They've grown so much since I've been away!" he said. Brian puts in long hours, but he says it helps the time pass quickly. We'll be glad when he's back home to stay. Our Mexican branch of the family are also doing very well. I've been able to call them regularly. I'm so grateful they now have cell phone service. They recently began attending their local ward, and they all tell me how much happier they are. Thirteen-year-old Zachary says, "It's changed our family for the better." I hear it in their voices, and I believe him. We're having a halloween party next weekend for the family here in the valley. I can't wait! When I get tired and discouraged I am learning to change my thinking and count my blessings instead. And, truthfully, even with our challenges, we have much to be grateful for. 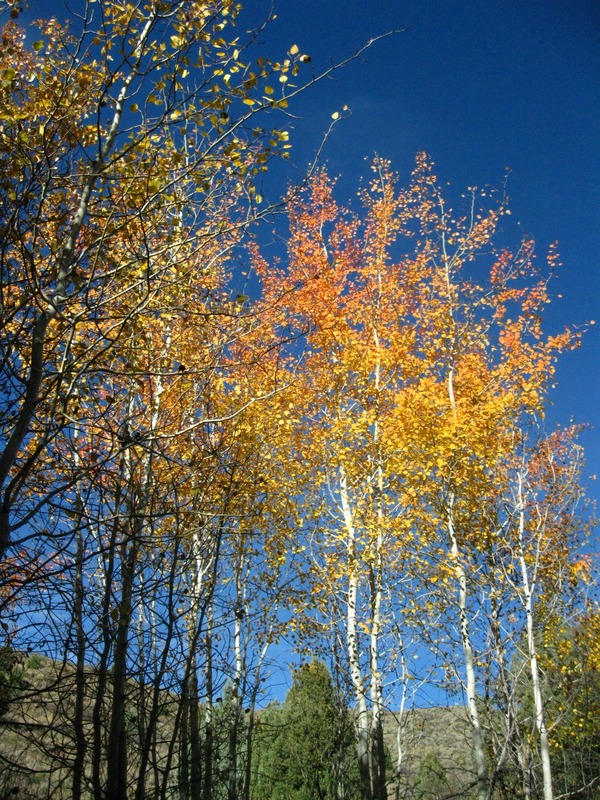 Oh how I LOVE aspen in autumn!!! Beautiful as always!